The Crested Mockiwi (トサカマッキー?, lit. : "Crest Makkī") is an enemy found in Hey! Pikmin. It is a more aggressive subspecies of Mockiwi, which is purple in color and has a crest of pink feathers on its forehead. The Crested Mockiwi is similar to the standard Mockiwi, but has more health and is faster. It also has a unique attack, where it roars and charges towards the player and Pikmin. 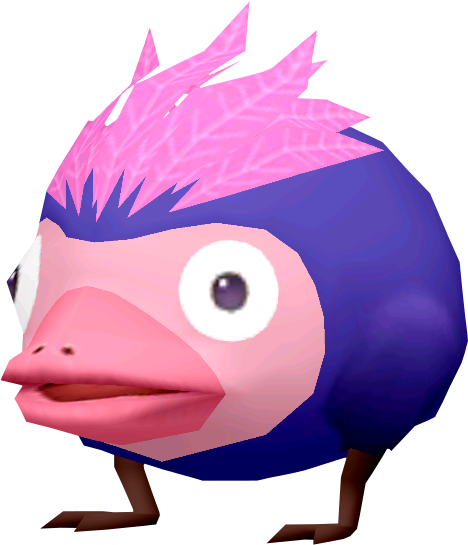 The Crested Mockiwi can be defeated in the same way as all Mockiwis can be; by throwing Pikmin onto its back. If it charges, a Pikmin throw to its head will halt it. The Crested Mockiwi drops 2 Sparklium when killed. This page was last edited on February 25, 2019, at 18:57.